American Dental Association recommends that you change your toothbrush every 3 – 4 months or sooner if the bristles start to wear away. Dentists also recommend that you brush twice daily for personal oral hygiene. However, following these two consensus recommendations alone doesn’t completely protect your oral health. What you may not know is that the bacteria in your mouth are transferred to your toothbrush. Then these bacteria build up on your brush head. Minor or thorough cleaning with water doesn’t really rid your brush head of bacteria. A toothbrush that hasn’t been sanitized contains bacteria. If used again, those same bacteria are transferred back into your mouth, then back to your brush again. The cycle continues to repeat itself. 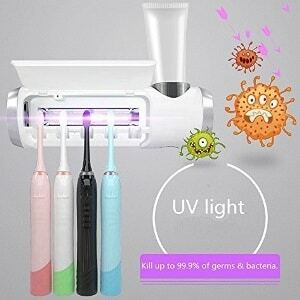 You need a UV toothbrush sanitizer to kill bacteria on your brush heads. In this comprehensive review, I review the five best UV toothbrush sanitizers in the market. In addition to that, I also review five best electric toothbrushes that come with UV sanitizers. Philips has one of the best UV sanitizing technology. With a simple push on the button, your toothbrush will be well sanitized. Bacteria will go from 99% to zero on your brush head. The UV cycle lasts for 10 minutes. You can turn off the sanitizer after this cycle is completed and your toothbrush will be ready for use again. This sanitizer offers a storing solution for brush heads. It can hold two brush heads at a time. 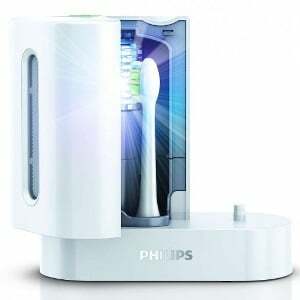 Philips Sonicare is a technology that gives the best results when compared to many other UV sanitizers in the market. Of course, there are other great ones you’ll learn about below. Philips Sonicare UV Sanitizer is backed by more than 140 publications representing clinical and laboratory studies conducted by more than 40 universities and research institutes all over the world. When you buy, you also get one set of brush head attachments for Sonicare brush heads, and one set of brush head attachments for Oral-B Brush heads (note that brush heads are not included). Philips Sonicare UV Sanitizer gives you the greatest care against bacteria. Connect the UV sanitizer to electricity. Unplug the UV sanitizer after 10 minutes. 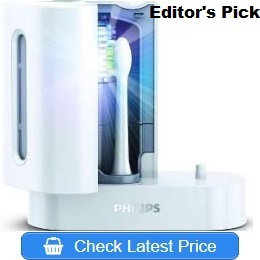 Bristles fray sooner with Philips Sonicare Sanitizer. You have to replace the toothbrush or brush head every two months to get optimal results with the sanitizer. I personally recommend replacement after 30 – 45 days of using the toothbrush or brush head. It’ll be better if they can make the bristles last longer so that it’s doesn’t seem like you’re buying a new brush head or toothbrush every month. Sarmocare UV Toothbrush holder is more than just a UV toothbrush sanitizer. I’ll call it 3-in-1. It’s a toothbrush holder. It’s a UV toothbrush holder. And it’s also a toothpaste holder. Imaging a sanitizer that does more than sanitizing? That’s exactly what Sarmocare UV Toothbrush holder is. Sarmocare gets rid of germs and bacteria from your toothbrush. When that’s done, you can then use it to hold your toothbrush and your toothpaste. Sarmocare has a drying fan. The first 4 minutes are spent drying the brush head. When drying is completed, the UV light is turned on. That immediately indicates Sarmocare has started sanitizing the brush head. Sarmocare UV Toothbrush Holder can store up to five toothbrushes at a time. You can also store electric toothbrushes in it. Sarmocare dries the toothbrush quickly and kills 99% of germs and bacteria. The whole sanitizing period will last 8 minutes. Note that the first 4 minutes are spent drying the toothbrush to prepare it for sanitization. The battery lasts 240 minutes. You can use a full battery for up to 30 times. If your toothbrush has a heavy handle, be rest assured that Sarmocare can take care of it. Buying Sarmocare means your toothbrush and toothpaste can live in the same place. Find a perfect place in your bathroom to stick Sarmocare to the wall. It comes with a sticker. Ensure that the location is close to an electric socket for easy plugging. Put your toothpaste in the right place, which is at the top of the holder. Insert the brush head into the UV toothbrush sanitizer. In the first four minutes, Sarmocare will dry the brush head. After drying, the LED light will turn on to indicate that it’s sanitizing. After an additional four minutes, the sanitization cycle will complete and Sarmocare will auto shutoff. Then you can open the cover and use your toothbrush. Sometimes, the sticky stuff at the back of Sarmocare UV Toothbrush Holder that makes it stick on the wall doesn’t last long. Most stickers stop holding well after a month. That can be very disappointing. It’ll be cool if they can make the sticker lasts longer. Violife Style Zapi Luxe UV Toothbrush Sanitizer can last up to 8,000 hours. The batteries aren’t rechargeable. You’ll have to replace them once they’re low. The technology that’s used to build this UV sanitizer is the same as the ones found in hospitals and high-end water purification. Violife UV Toothbrush Sanitizer eliminates 99% of germs and bacteria. The design of the sanitizer is sleek and stylish. It looks cool in bathrooms. The sanitizer comes with 1-year warranty. Violife UV Toothbrush Sanitizer is portable. You can take it along when you travel. Violife UV Toothbrush sanitizer works well. However, I quickly realized that some people don’t like its shape. It looks more like an egg. It can fall easily if it’s not positioned in a balanced place. The great thing about this UV toothbrush sanitizer is that it can work for a very long time assuming you keep changing the batteries when they’re low. While this sanitizer is portable and good for people who travel a lot, it can turn on very easily in the bag, wasting unnecessary battery power in the process. So, if you’re going to take it along when traveling, you’ll have to ensure that it’s not in a place where the battery can turn itself on. Insert your toothbrush facing the left into the top hole of the UV toothbrush sanitizer. After inserting, gently click the handle into the rubber holder to ensure that it’s fixed. Then press the button in the front to start sanitizing. The blue light at the front will blink slowly for six minutes. When the sanitizing cycle is completed, you can power it off and use your toothbrush when next you’re ready to brush your teeth. When the light at the center starts to blink quickly, it indicates the batteries are low, and it’s time to replace them. While I like the design of the product, I’ll love to see this toothbrush sanitizer sits more firmly than it currently does. The design should be altered a bit without affecting the uniqueness of the product. It’ll also be better if the batteries are rechargeable rather than having to buy new ones. When I analyzed everything about Violife UV Toothbrush Sanitizer, I think it’s still a solid sanitizer. I’ll say it’s the perfect choice for stylish people. 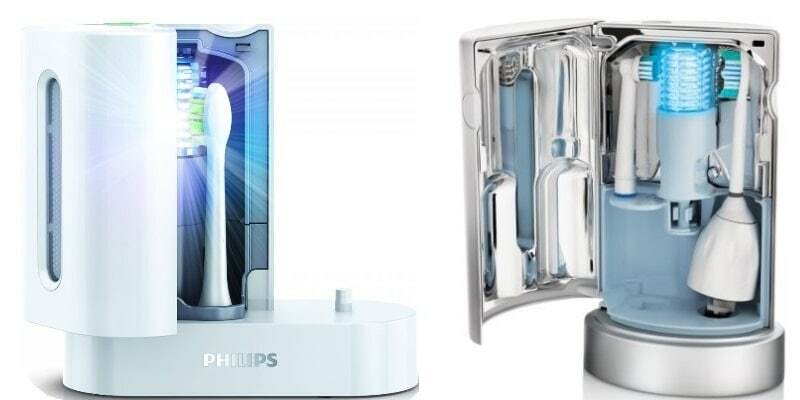 This toothbrush UV sanitizer from Philips comes with everything you need. You’ll receive toothbrush handles and a sanitizer. Keep in mind that your toothbrushes stay in the handles where you also sanitize them. There’s no need to remove a toothbrush from its handle if you’re aren’t ready to use it. This is a perfect solution for people with kids. The product is cheap and works incredibly well. You have the right to return the product if you’re not satisfied the first time you use it. Philips is a brand you can trust. Philips Sonicare Flexcare and UV Toothbrush Sanitizer remove 99.9% of germs and bacteria from your brush heads. The cost of buying this UV sanitizer is low when you compare it to the many options out there. Why buy expensive sanitizers when you can get the same result with this one? Higher price doesn’t always mean better, and that’s the case here. 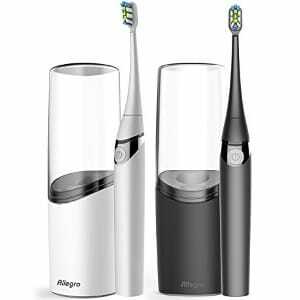 You can use it with both electric and ordinary toothbrushes with no problems. 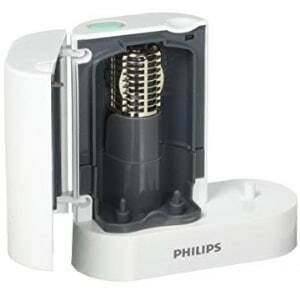 Philips Sonicare Flexcare and Healthy White UV Toothbrush Sanitizer last long. Many customers say they’ve been using it for months, and some for 2 – 3 years. If you have kids, this sanitizer is the perfect option for them. The color is pure white. White always look cool in the bathroom. The sanitizer is also portable. You can carry it wherever you want to go in a bag. Kids love things that are easy to carry. Insert the toothbrush in the holder. Press down the white button to begin the sanitizing cycle. The UV cycle should last for about 10 minutes. It will automatically shut itself off after the UV cycle is completed. Your toothbrush will be ready for next use. You can leave it there in the holder. During use, Philips Sonicare Flexcare and Healthy White UV Toothbrush Sanitizer make a little noise that’s a bit annoying. It’ll be cool if they can get rid of this noise. Having said that, this UV toothbrush sanitizer is one of the best you can get for kids. I highly recommend it if you want a great toothbrush sanitizer from a brand that’s respected in every part of the world. UV Toothbrush Sanitizer is a new generation technology for disinfecting brush heads. The sanitizer takes only 3 minutes, and it completely gets rid of germs and bacteria from your brush head. When the sanitizer is fully charged, you can use it for up to 50 – 55 times. This UV sanitizer is perfect for both electric toothbrush and ordinary toothbrush heads. It’s very easy to use. Just put the toothbrush head into the sanitizer box and press start when the lid is closed. It’ll stop itself when the sanitizing cycle is completed in 3 minutes. The UV Toothbrush Sanitizer is portable. For people who travel a lot as I do, this UV sanitizer is perfect for you. And a fashionable case for carrying it. It charges fast through its USB port. If you’re looking for a small and lightweight toothbrush sanitizer, this should be at the top of your list. UV Toothbrush Sanitizer is simple to use and does the job well. Charge it through the USB port till it signals its battery is fully charged. Insert your brush head into the sanitizer. Press start and the cycle will last for 3 minutes. It’ll automatically stop after completion. When it’s completed, remove the brush head, and you’re good to use it again. UV Toothbrush Sanitizer is cheaply made to be affordable. The holder doesn’t fit some brushes. It’ll be better if they can fix these issues. There are some factors you should take into account when choosing a sanitizer. On this page, I reviewed five best UV toothbrush sanitizers. Sure, you’ll find a lot of other sanitizers out there, but most don’t deliver the effectiveness you want. You want a toothbrush sanitizer that eliminates germs and bacteria from your brush heads. Let’s talk about the things you should look for before paying for a sanitizer. I must point out that there are lots of old sanitizers out there. I’m not saying they aren’t effective. The truth is that over the years, we’ve had better technologies. The same is true for toothbrushes. Each passing year, there’s an innovation in the dental space that helps us have better oral health. Before buying a UV sanitizer, you should confirm if it’s advanced or new. For most sanitizers, newer versions are more advanced than older versions that were made years ago. The sanitizers listed above are all new and advanced. Their UV light technology is almost unbeatable by no other. Only the brush head should be allowed in. There should be no opening or space. If the location for the brush head isn’t fully enclosed, it means the UV sanitizer isn’t that effective. Because as the sanitizer works, there’s air coming in. Ensure that the design doesn’t allow any space for air. UV sanitizers are not rocket science. They should be easy to operate by most people who can brush their teeth. Dentists generally recommend that kids start brushing their teeth by themselves between 8 – 10 years old. So, kids within this age group should be able to use UV toothbrush sanitizers. A UV sanitizer that isn’t easy to use isn’t the best for you. Most of the sanitizers I’ve reviewed are very easy to use by almost anyone who brushes their teeth. There’s a popular saying that “you get what you pay for.” I believe that. Expensive UV sanitizers do a better job. However, most sanitizers aren’t out of reach for most households. Regardless of your income, you should be able to afford a good and effective UV sanitizer without breaking the bank. If a sanitizer is outrageously expensive, it’s a sign that it doesn’t do the job well. If you’ve read this far, I want you to know that I’ve reviewed the best UV toothbrush sanitizers that are almost unbeatable by many other options out there in terms of cost and effectiveness. But I want to give you more. You may be considering buying an electric toothbrush that comes with its own UV sanitizer. That will save you some bucks, right? Okay, it’s a good idea to buy an electric toothbrush that has a UV sanitizer with it. But before you buy one, you need to know that you’re getting the best sanitizer with it. 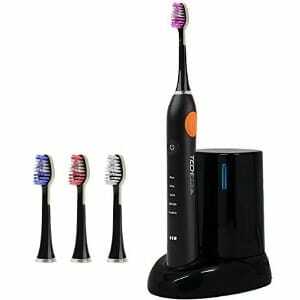 Below, I quickly review the five best electric toothbrushes with UV sanitizers. This is one of the most advanced electric toothbrushes. It has a Smart Sensor technology that lets you know if you’re brushing too hard or not. It also has a Touchup feature that provides data on missed areas. With this, you’ll have cleaner teeth after brushing. The packaging comes with a high-quality UV sanitizer from Philips. You’ll be getting a high-quality brush with an excellent sanitizer from the same brand. You can download the free Sonicare app from Google Play if you use Android or Apple Store if you use iOS. The app helps you set goals, track progress and receive personalized coaching, tips, and alerts. This toothbrush and UV sanitizer gives you better oral health. 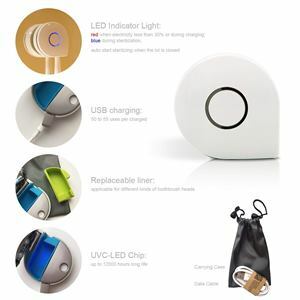 The package contains an electric toothbrush with a portable UV sanitizer you can take anywhere you go. It’s batteries last 30 days when fully charged. You get a constant reminder as soon as the battery starts running low. Noise is extremely low during usage. The sanitizing cycle lasts up to 2 minutes. There’ll be zero germs and bacteria after sanitizing. The sanitizer has a sleek design and looks nice in the bathroom. The packaging comes with a little booklet that guides you on how to use it. If you want a great electric toothbrush that comes with a nice UV sanitizer, this should be at the top of your list. 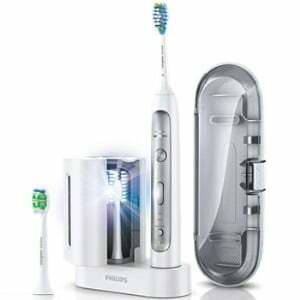 This is another version of the Philips Sonicare Flexcare Platinum rechargeable electric toothbrush with UV sanitizer. The difference between this version and the number on this list is that this one has a more stylish design. If you care a lot about the design of the toothbrush and sanitizer without any downturn in performance, you’ll want to get this version. You can choose the Deep Clean mode. The option lets you tackle trouble and deep areas with less effort. The toothbrush does most of the work with gentleness and great care. There are nine customizable brushing experiences to choose from. You’re free to adapt the intensity to your brushing needs. iBrush is developed by Dr. Patty Martin, a respected dentist in the United States. This electric rechargeable toothbrush comes with a UV sanitizer and three extra brush heads. You can choose from five different operating modes to comfortably fit your teeth and gum. It has a 2-minute timer with QuadSense – an advanced technology that ensures that each area of your mouth is brushed. The UV sanitizer is perfect as it kills 99% of germs and bacteria in your mouth. The toothbrush and sanitizer can last up to six weeks when fully charged. It has five clean modes: Clean, Sensitive, White, Gum care and Massage. You choose the brushing experience that’s best suited for you. The sanitizer kills 99% of bacteria in the brush head. The bristle of the toothbrush is approved by the FDA. So, you can expect nothing less than a comfortable and safe experience when using this electric toothbrush and UV sanitizer. The toothbrush has a 2-minute timer as recommended by dentists. It has a reminder of when to change the brushing area. If you’ve been brushing the same area for a long time, the toothbrush will ask you to switch to the other area. That’s a cool feature. 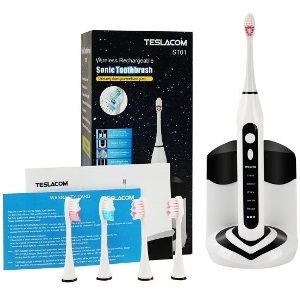 Teslacom Sonic Toothbrush with UV Sanitizer is without a doubt one of the best electric toothbrushes that comes with a great sanitizer. 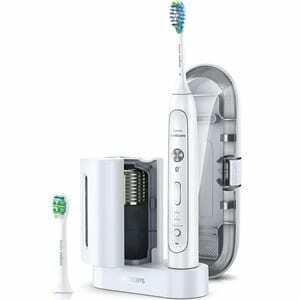 The product has a 1-year warranty to ensure you get maximum satisfaction from using this electric toothbrush. If you’re not using a UV sanitizer to get rid of germs and bacteria from your toothbrush, you’ll be putting them back into your mouth when you make use of that toothbrush again. You should avoid that. That is why I’ve taken the time to do most of the work for you and present you with the best UV toothbrush sanitizers. And I didn’t stop there. To ensure that this review is useful to you, I also reviewed top five electric toothbrushes that come with UV sanitizers. The sanitizers I reviewed on this page are the best you can get. Very few out there will deliver the level of high-quality experience you’ll get from them. So, don’t waste your time searching again. I’ve done the legwork for you. Time to make the right decision and buy the right UV sanitizer that will give you better oral health. Don’t hesitate in taking action today.